On March 9, 2016, the Animal Legal Defense Fund filed a lawsuit to free the animals who live in terrible conditions at Animaland Zoo in Pennsylvania. The roadside zoo houses more than 50 animals, but the lawsuit centers on “Bear,” a gray wolf, and “Baby,” a Siberian tiger, due to their endangered species status. The lawsuit also alleges that the lack of care of the other animals, which include two black bears, an arctic fox, and three capuchin monkeys, additionally violates the Pennsylvania State Game Commission regulations. 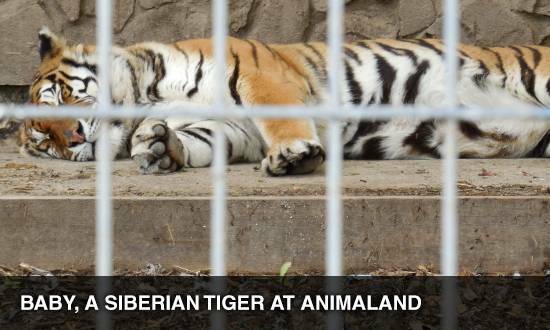 We believe public pressure will help the Animaland owners make the right decision—to retire all the animals at the zoo to reputable sanctuaries. I believe that Animaland should release the animals in its custody so that they can live out the rest of their lives in sanctuaries that can meet each animal’s physical and psychological needs. Please let “Bear,” a gray wolf, and “Baby,” a Siberian tiger, and the rest of the animals live out their lives in peace.